It is a perfect Autumn day, bright and sunny and fresh. I love days like today, even more so because we are going to Cornwall next week and if the weather is anything like this we will be very happy! The bright sunshine today has given me an opportunity to take a picture of my second slouchy, I had this finished a few weeks ago and just needed to sew up the tiny bit at the back and take a picture. 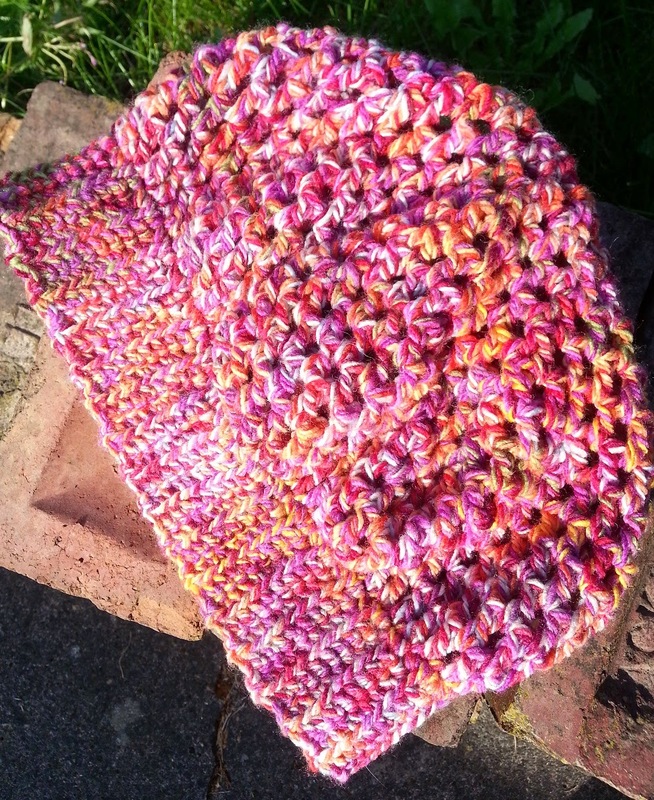 I am very pleased with it, I really do love this Sirdar click chunky yarn, very bright colours too! While in an Autumnal mood I have been working on something to use up that big ball of wool I bought last week. I wanted to make something to wear and something using a slightly more complex pattern than the granny stripes I had been making. 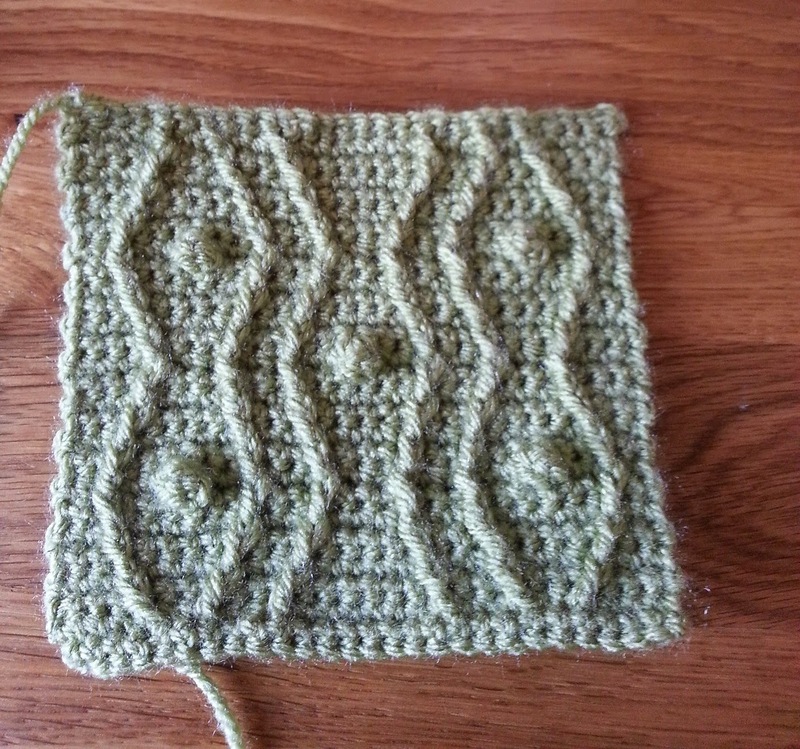 I decided to try something completely new and use a stitch I hadn't tried before. Star stitch! Well, star stitch and trebles. I did try just using star stitch but it was coming out much too dense a fabric for what I had in mind. If you don't know how to do star stitch there are some good how-tos on youtube but I will probably do a picture tutorial for it when I write up this pattern... that's if it all works out OK, it's not finished yet. I'm not going to tell you what it is going to be in case it goes horribly wrong, but I am really enjoying every last stitch of it! I hope you are having a happy hooky weekend too. 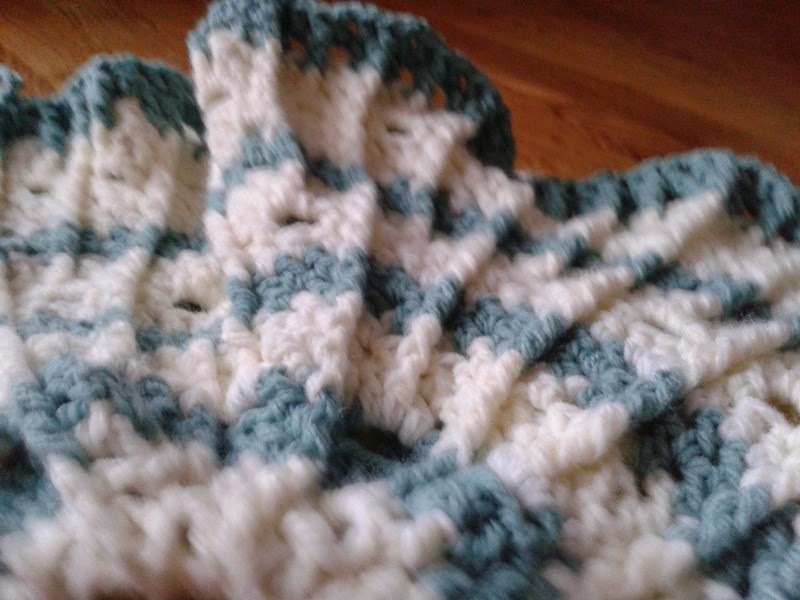 Making this baby blanket has been very disjointed. For once I had this and only this on the go but I started this just after I started my new job and my crochet time has been severely limited. 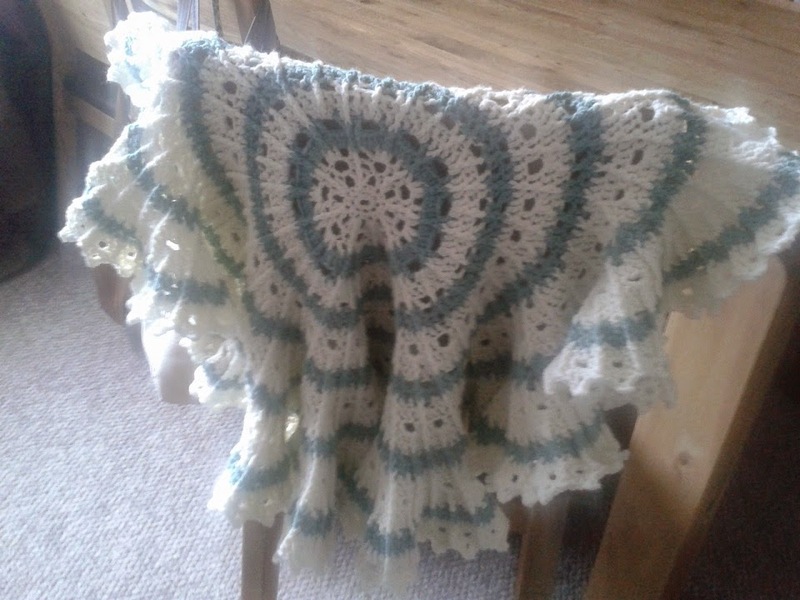 I managed to get a few rows a day done and it felt like it took ages, in reality it was only a couple of weeks but not so long ago I would have had it done in a few days. I found this slow progress really frustrating. 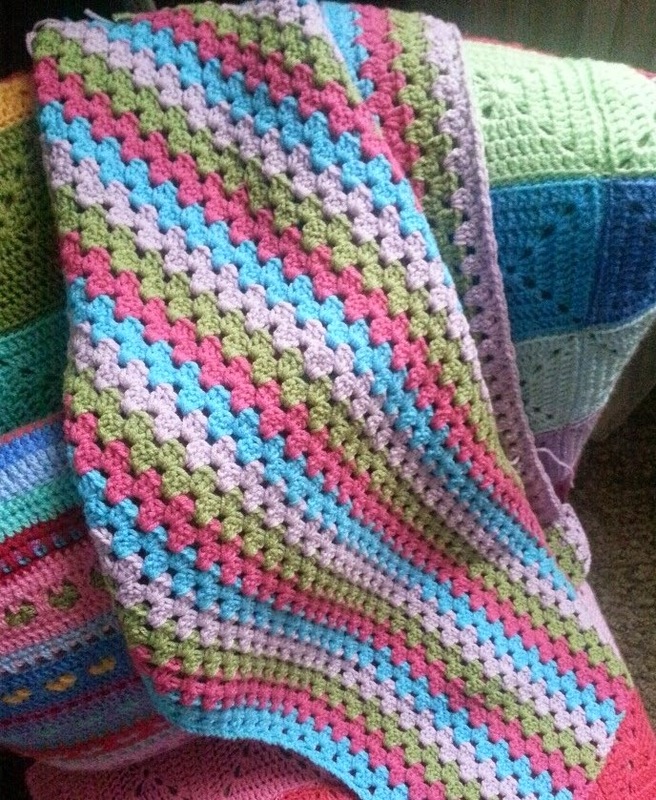 But yesterday evening I finished the last bit of edging and can now finally proclaim this blanket finished! Ahh that is extremely satisfying! 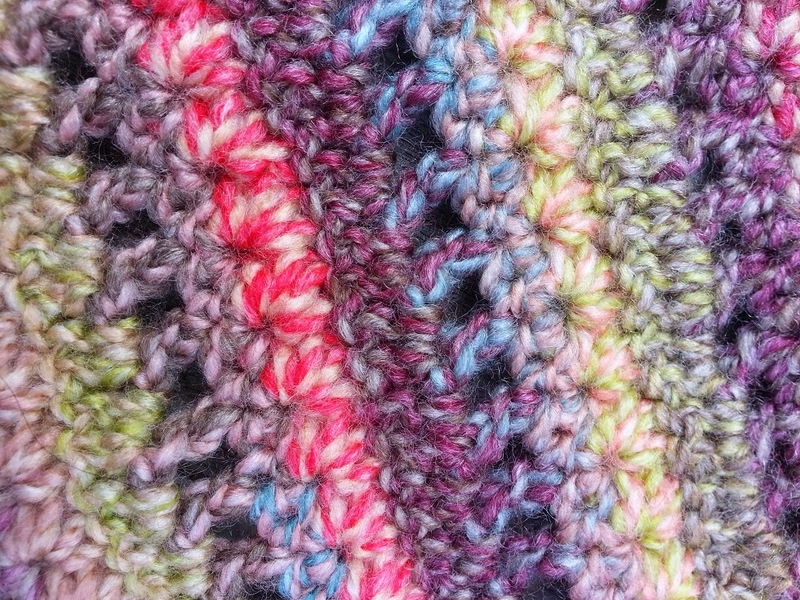 I absolutely love these colours and this yarn is snuggly soft and smooth to crochet with. So, some info about it. Yarn - James C. Brett Cotton-on. Amount - I bought eight 50g balls and it used most of all of them, I still have about 50g left of little scraps altogether. Cost - Not much at all! This yarn is surprisingly luxurious for the price. Construction - 33 granny stripes, that's 66 granny rows altogether (each stripe being made of two rows) and 16 Granny circles into squares, 8 across each end of the blanket. 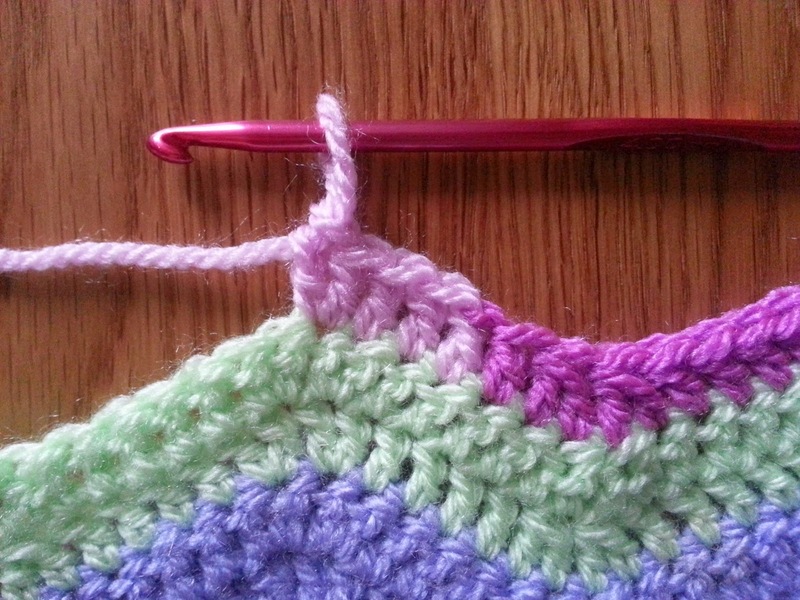 Edging - One row of granny clusters, one row of trebles (in lilac). one row of *1DC, Ch 1 skip a stitch* repeat (in pink) then one last row of *1DC in next Ch space, Ch3* repeat. I was so impressed by this yarn that I treated myself today and bought one 200g ball of this James C. Brett marble chunky. 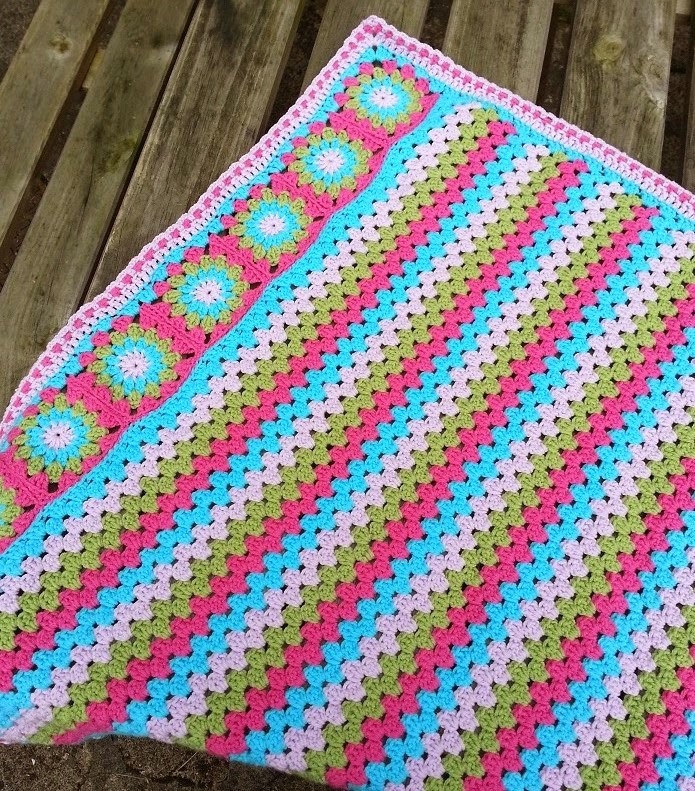 As lovely as it is to make a granny stripe blanket I am craving something a little bit more challenging. 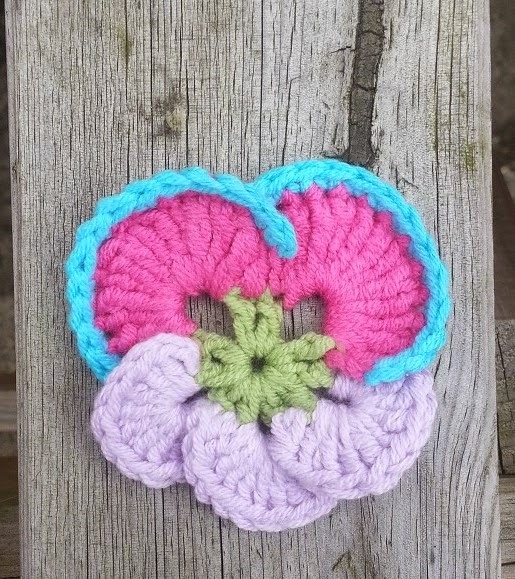 I don't know if that means a complicated pattern or making something up myself, I have a couple of ideas that I would love to try out and this yarn looks like it might be the very thing I need. I must say I am still finding the adjustment from being a lady of leisure to working full time pretty difficult. My house is a total mess and everywhere I look I see jobs that need doing. The garden is a disgrace and the decorating of the spare bedroom has fallen by the wayside too. 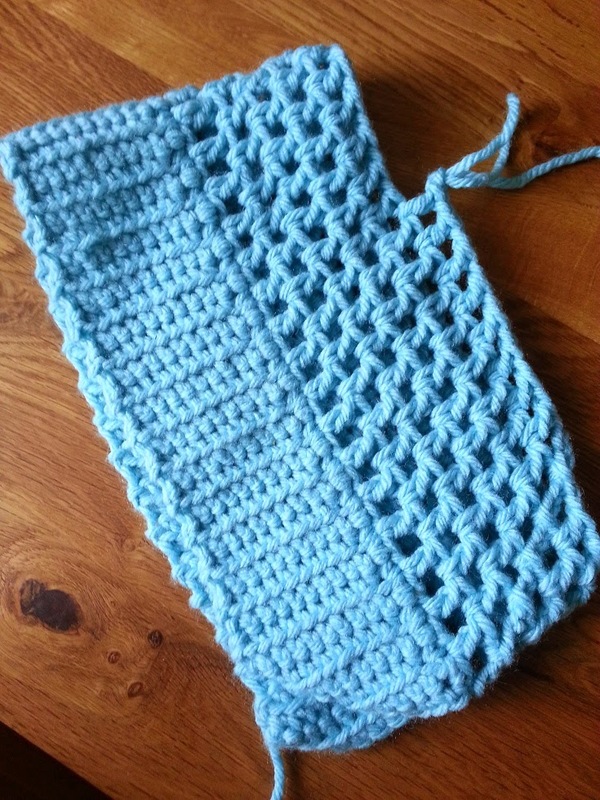 As for crocheting, I seem to have no time at all. I have been getting home at around six o'clock, have a quick cuppa, sort dinner out, feed and cuddle the cat (he gets very whingy around that time) do some of the jobs that need doing and by the time I get to sit down at around half eight my eyes are giving up through tiredness and crocheting has to be kept to a minimum. 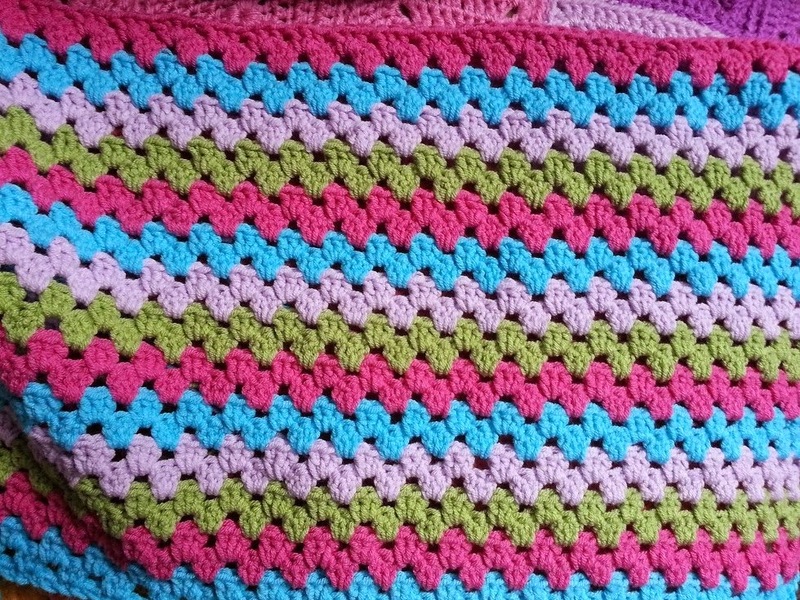 I am so pleased that I started this baby granny stripe blanket, I don't really need to look at what I am doing so the tired-eyes and limited time aren't as important, I can pick it up and put it down and not worry about where I am in the pattern. This doesn't help with all the other things that I want to make though, I have lots and lots of ideas buzzing around in my head and I desperately want to get cracking on them. My drive to and from work is quite often spent stuck in traffic which gives me plenty of time to think and come up with new ideas. I was sat in one of these unmoving-for-20-minutes traffic jams this morning, it was grey and very boring, I looked over to my left and saw the prettiest little cottage. 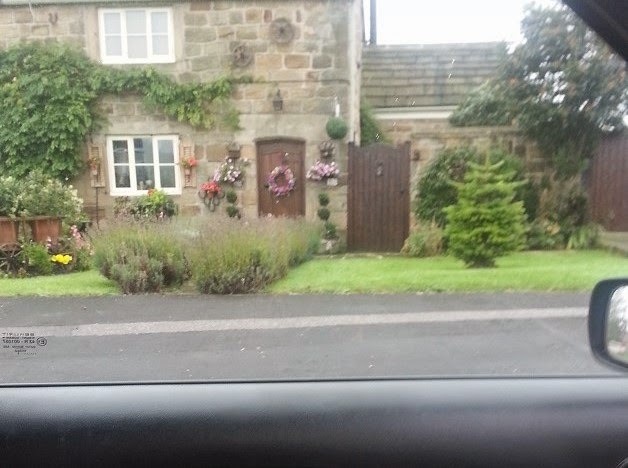 It's not a great picture I know, but can you see the flowery wreath on the front door? Such a lovely thing to see and it really brightened up my otherwise painfully dull commute. 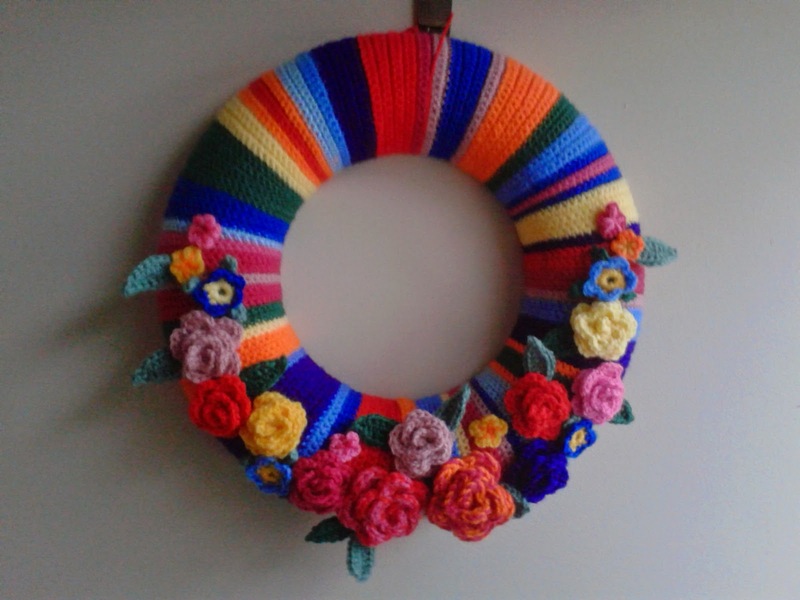 It got me thinking of wreaths in general and in particular this one. 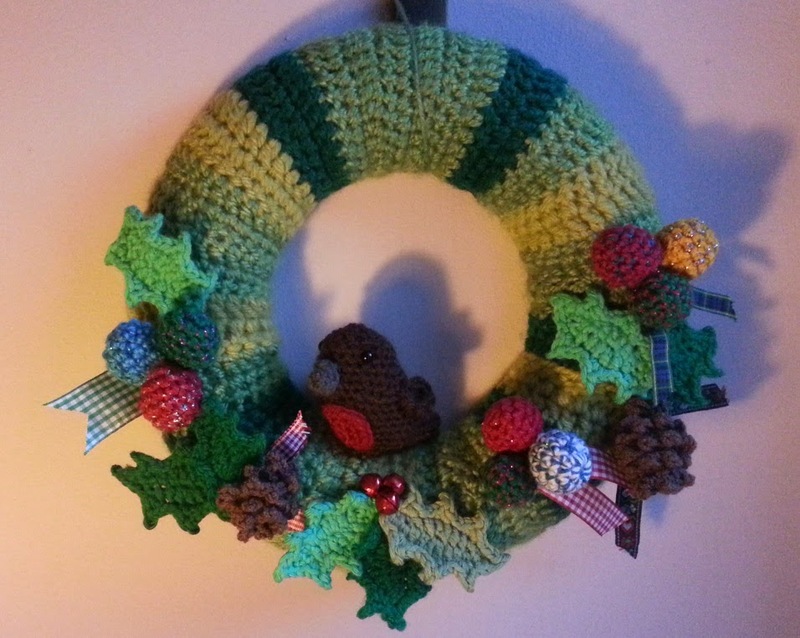 I started this wreath last year, I wanted to get it finsished by Christmas 2013! It was going to be a big floral thing but I just couldn't decided what to put on it. I made a load of flowers and leaves and other little bits and pieces but I couldn't get them to look right when I put them all together, I think I was cramming too much on to it, too many ideas when lots of the same thing would have been more effective, like with my other wreaths. Anyway, the cottage wreath inspired me to dig the sunflower one out when I got home and have a rethink on what I am going to do with it. To be honest, I am not as keen on my colour choices now as I was when I made the cover, I might rip it off and start again. 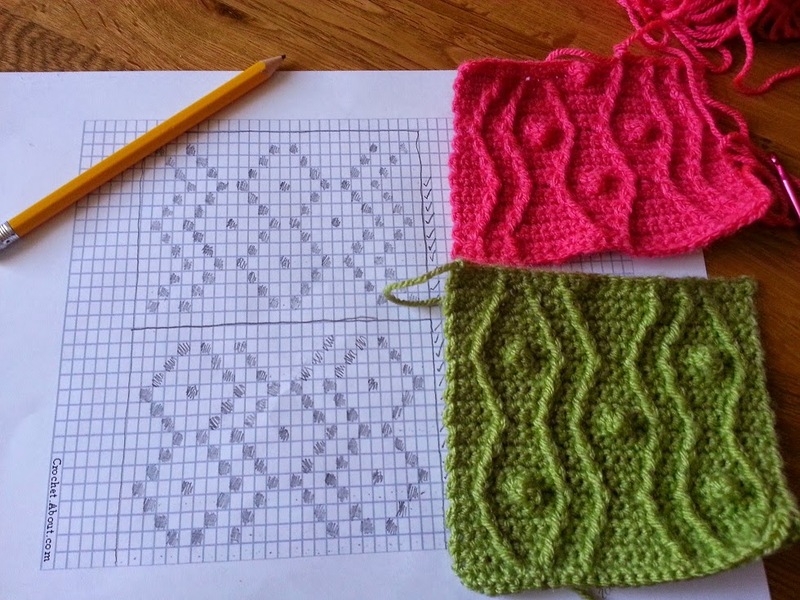 it would give me something new to do where again, I won't have to worry about the pattern and can just do a bit when I get five minutes. I know I am not the only working woman and there are plenty of people that manage to be out of the house all day and still cram lots of other stuff in too. I used to be like that so I think the last couple of weeks have just been an adjustment phase and I will get back into the swing of things, eventually! I found a dinky little wool shop on my travels around the village near where I work. They only sell one brand of yarn, so I wasn't too hopeful at finding much that I liked - but I just need to see a sign for a wool shop and it's like catnip, I can't resist! James C Brett isn't a brand I am overly familiar with, I tend to stick to what I know. 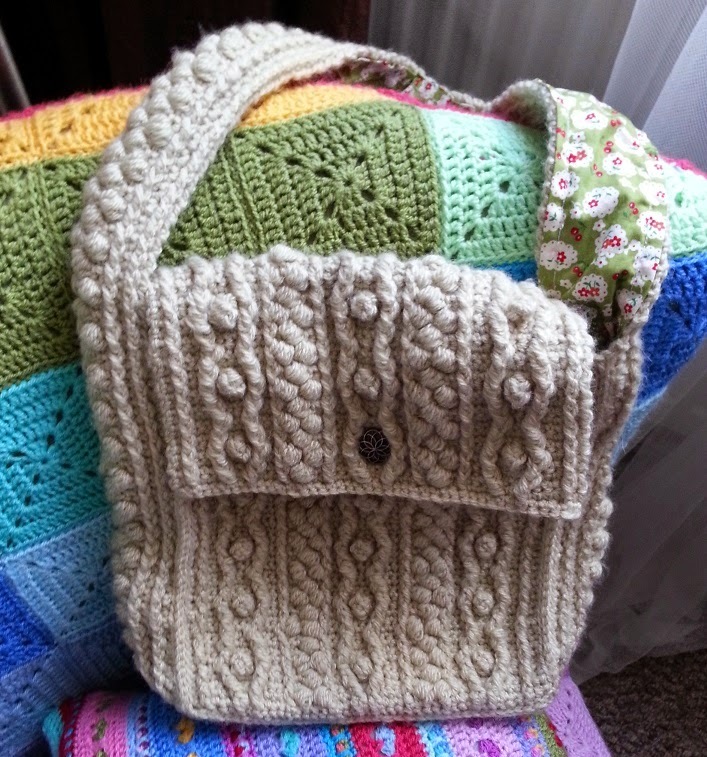 Not because I don't want to try new things but I tend to buy from my local shop or order online so I have got used to my Rico, Stylecraft and Sirdar yarns. 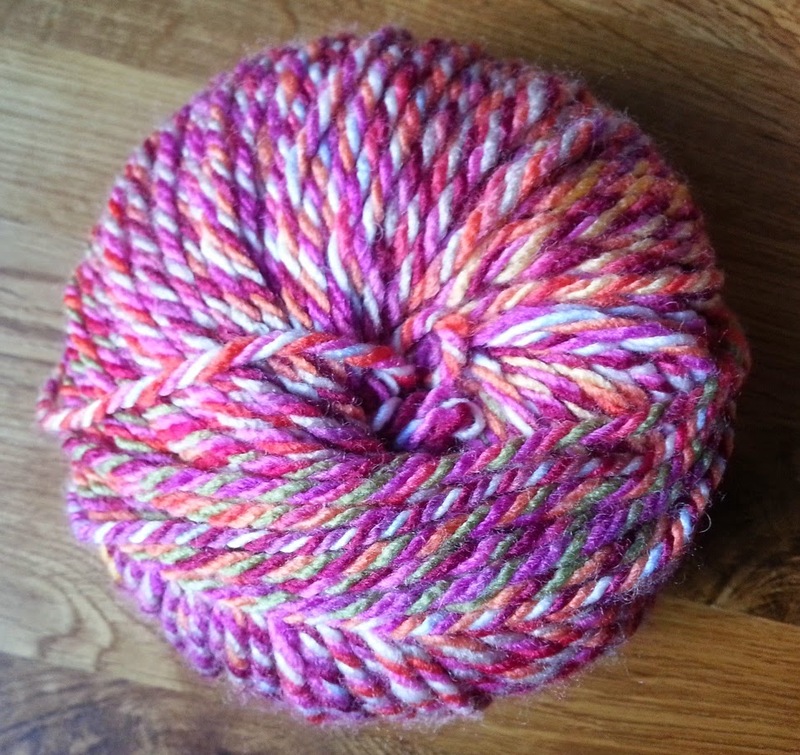 This little wool shop stocks James C Brett cotton-on and it is so lovely! Very soft and the colours are delicious. 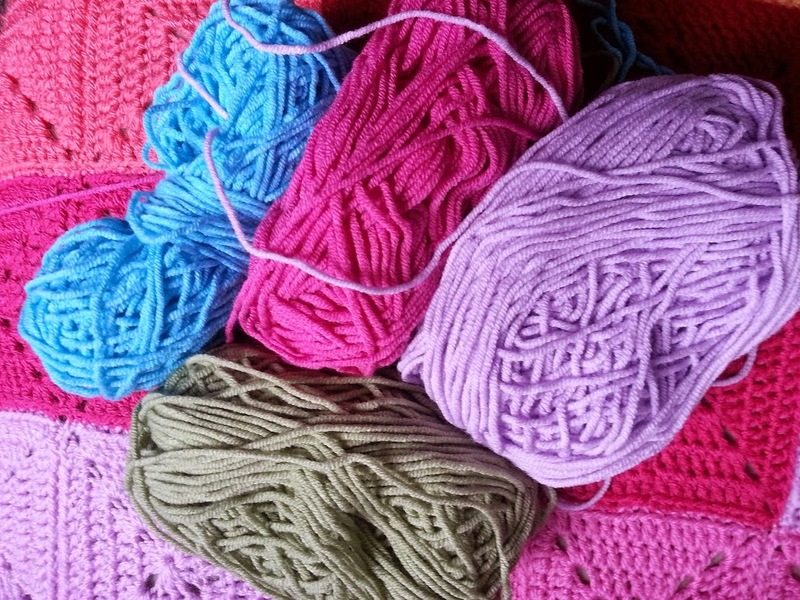 I picked four colours, with no specific plan as to what I would make with them and I think just choosing four was VERY restrained of me. I got home on Friday and was trying to come up with something to make. A very good friend of mine is expecting another grandchild soon and it will be a girl. 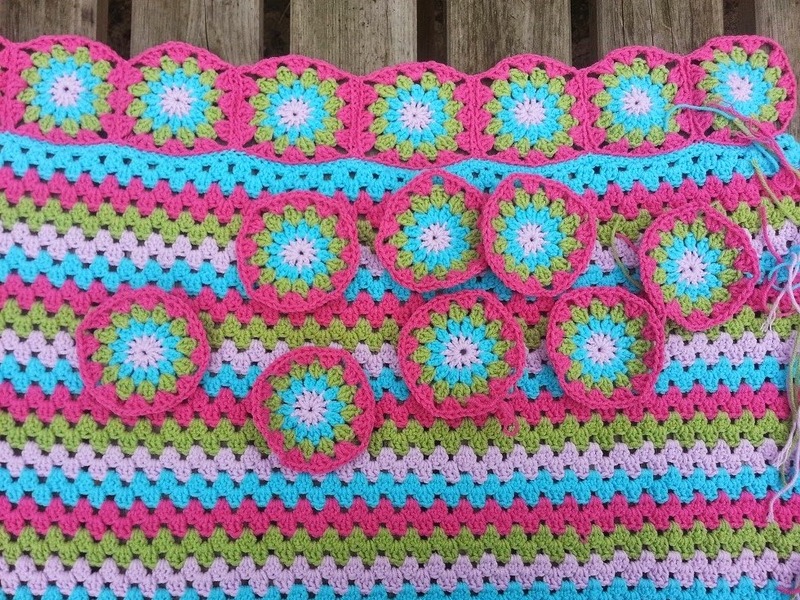 These colours just screamed baby girl to me so I settled on making a babies blanket for her. 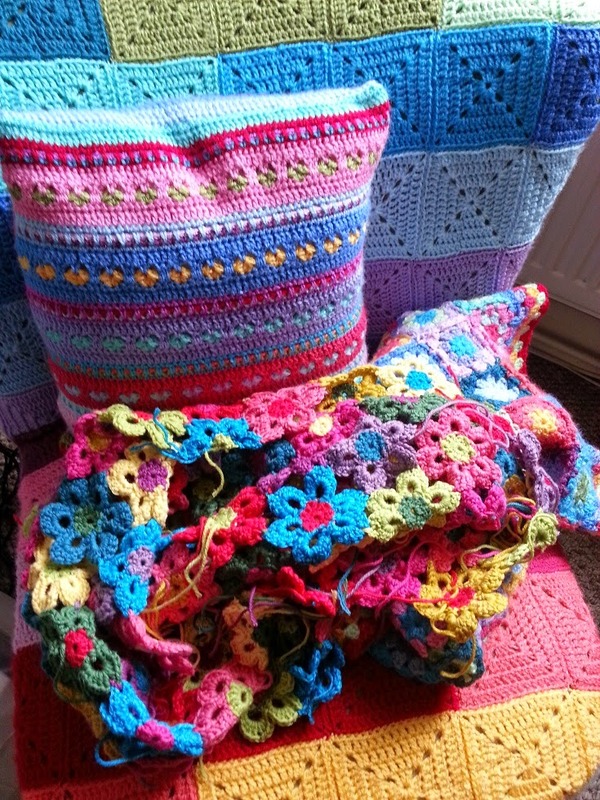 I have wanted to design my own blanket for a while now, I have lots and lots of ideas and my head was buzzing with all the possibilities but which one to pick? 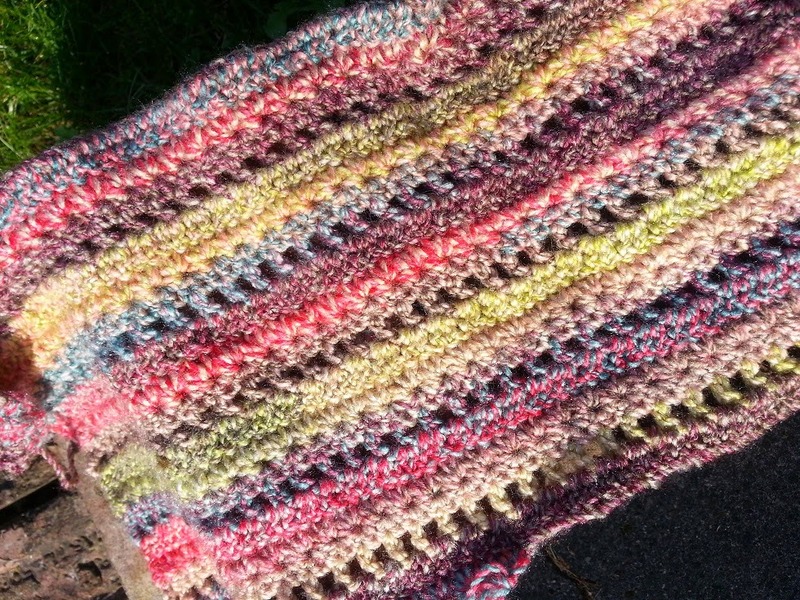 The two best things with this yarn are the colours and it's softness, picking any pattern that is too complicated or intricate may well take away from the gorgeousness of the colours and I didn't want to do that. 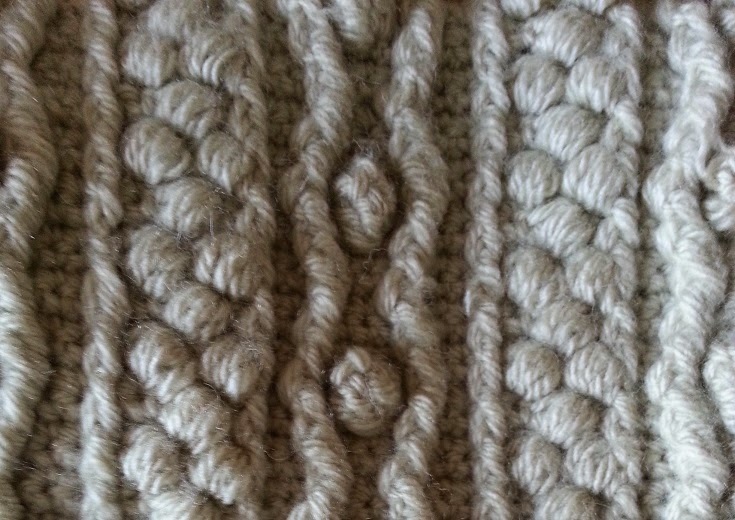 Similarly using the right stitch would be very important as anything too dense or bobbly would stop it being so lovely and soft. So despite my yearning to design my own blanket (and I really do want to) I took the philosophy of sometimes less is more and hooked up the foundation row for a simple, soft and pretty granny stripe. Using trebles this way, in clusters with gaps means that the yarn keeps it's softness - there are no tight knotty bits in the fabric that's made. 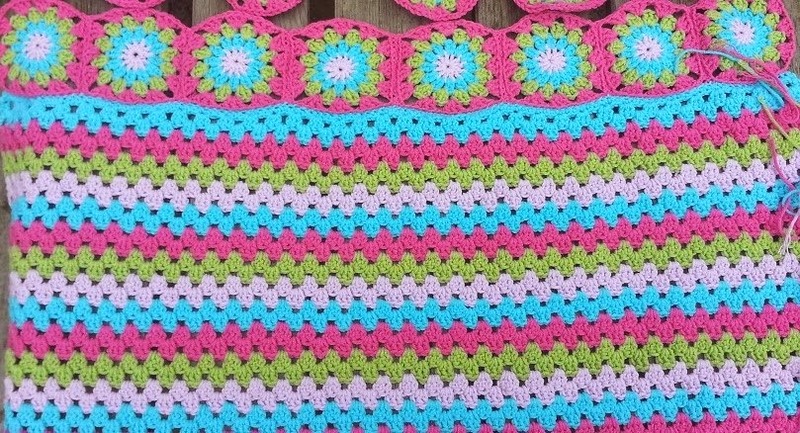 I will edge it with a girly frill of some sort and I might add a row of little squares to the top and bottom as I did with my big granny stripe blanket. 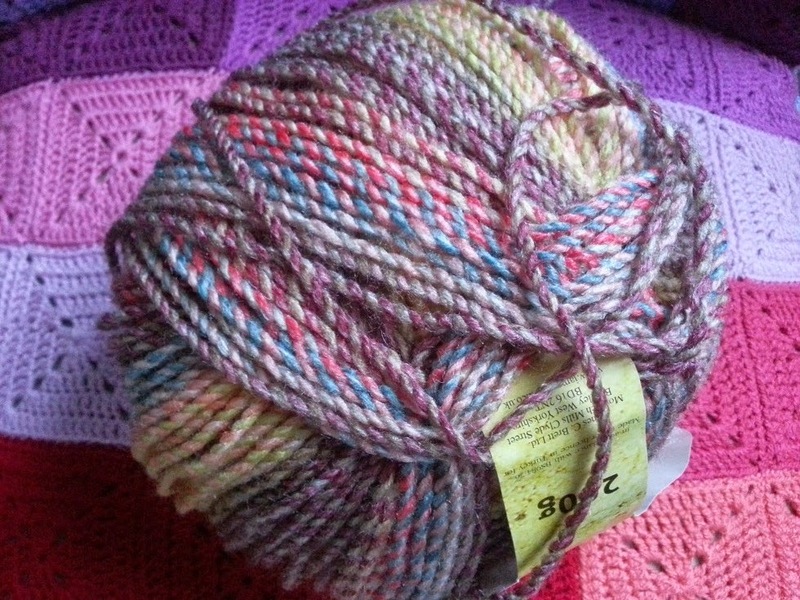 In fact I would love to make a full sized blanket with this yarn, it would be very luxurious indeed. 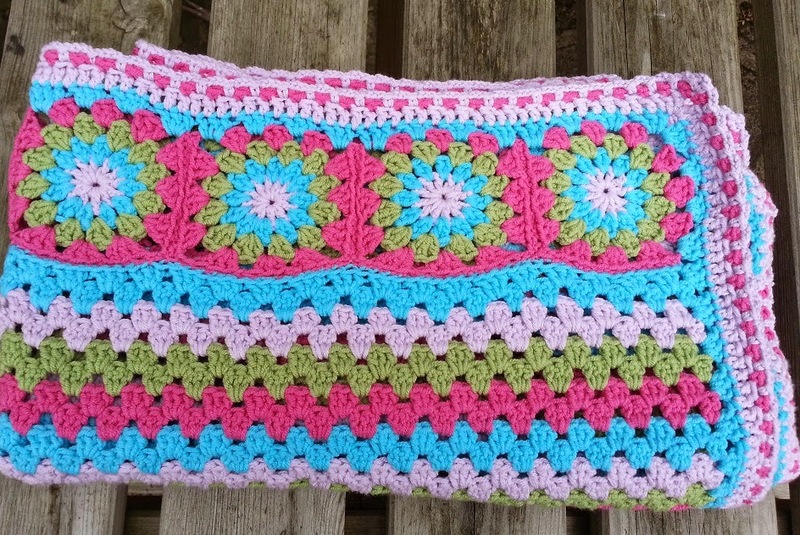 That may be a project for next year as I am already feeling behind on my Christmas crochet (eek!). Best get cracking with this! Another week of busy for me. My first week in my new job and it didn't start well. 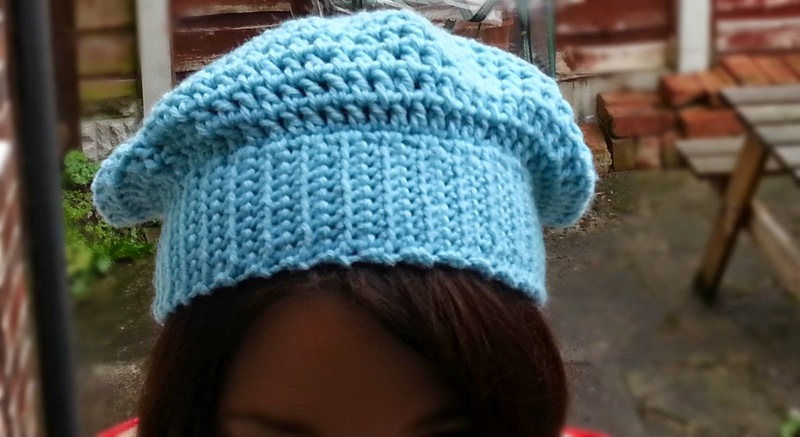 On Saturday I said that I wanted to get my slouchy hat pattern written up for you and intended to do it that afternoon. That was until I started with a bit of a cough that very rapidly became a full-on-take-to-your-bed-with-a-box-of-tissues-and-a-lemsip cold. 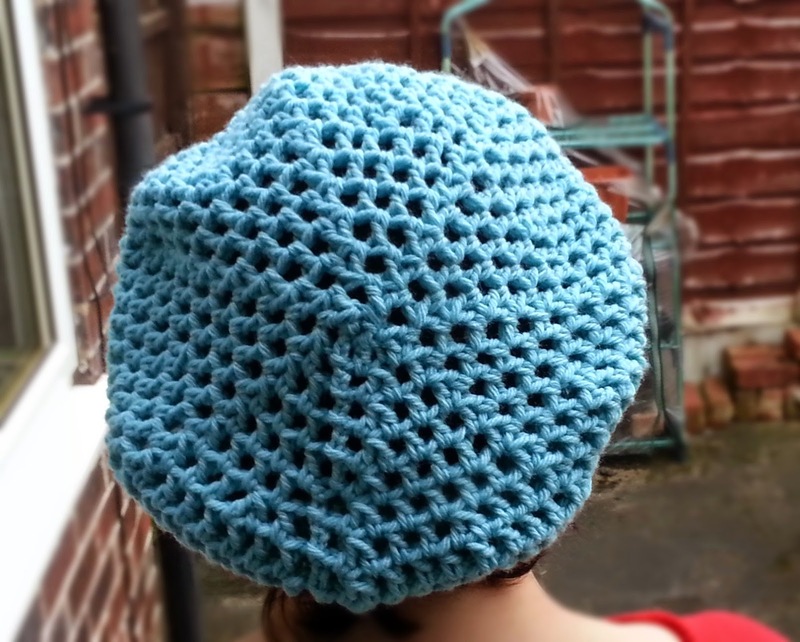 So by Sunday I was full of grottiness but did manage to write the pattern up and post it. My second day in my new job on Monday and I was so ill, I felt absolutely awful, dizzy, shivery and at 'peak cold', not a great way to start the week. 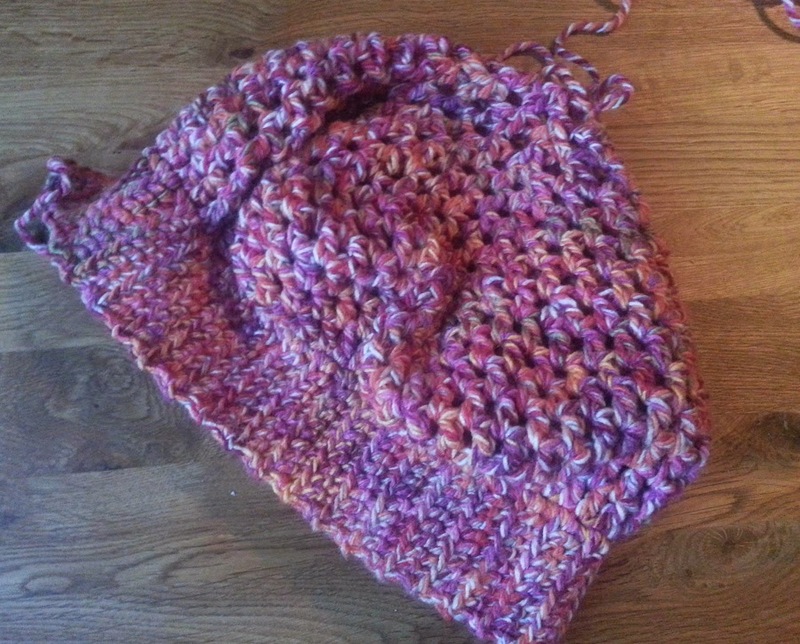 By Tuesday I was feeling better and thought it would really be a good idea to have a look at my slouchy pattern, written in a delierium of phlegm, and check that it actually made sense! I had popped into my friendly neighbourhood yarn shop (SewSusieBloom in Castleford) on Saturday morning and got myself a couple of 50g balls of sirdar click chunky to use for photos while I wrote the pattern up, so decided to carry on and finish the second hat. It isn't the best written pattern, for some reason the phrasings I have used are a little bit confusing in places and I really could have made it look more simple but it works and I think it makes sense. My second hat has turned out the same as the first one so that is encouraging! I just have to tidy it up and sew the two ends in and it will be all done. 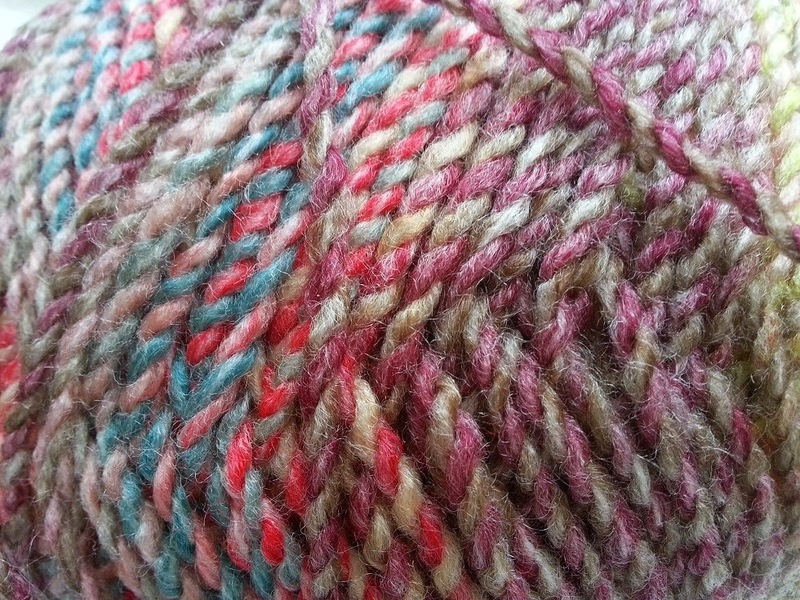 I do love this yarn, this picture does not do it justice! With nothing else on the go and having serious crochet withdrawal, last night I just wanted to make something, anything at all. My head is still a bit foggy and I couldn't think what I wanted to make, I searched patterns, wasting valuable hooking time and came up blank. 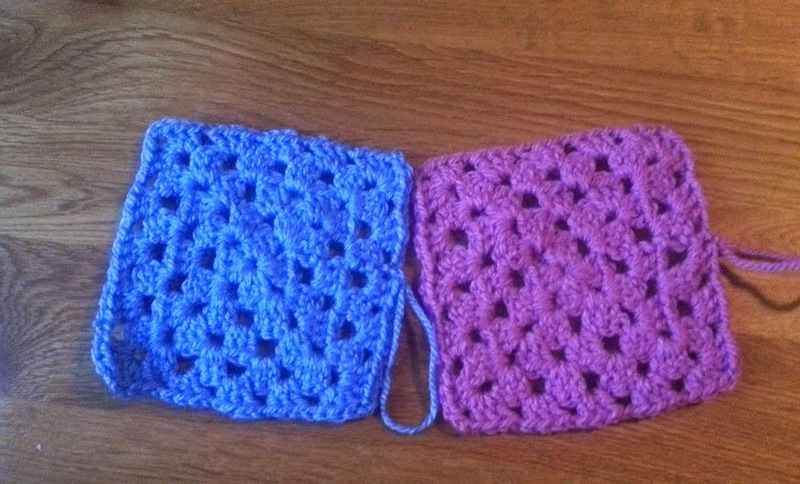 In sheer frustration I just picked up the nearest ball of yarn I could lay my hands on, my trusty red 4mm hook and made a couple of granny squares. Just because. 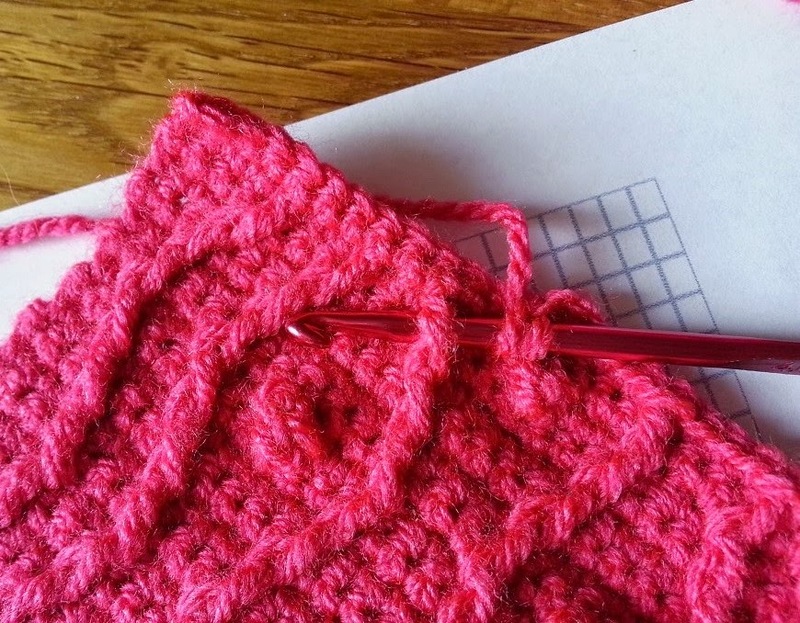 I am sure that once I have settled back into a working week and got myself organised I can come up with something better than a couple of granny squares but they were such a relief to make, no thought, no bother just that wonderful act of crocheting. Yes we all know that you should join new yarn at the beginning of a row but sometimes joining part way through can't be helped. It's either a big long row and you just can't face ripping it all back or you are running out of yarn and need to squeeze every stitch you can out of it. 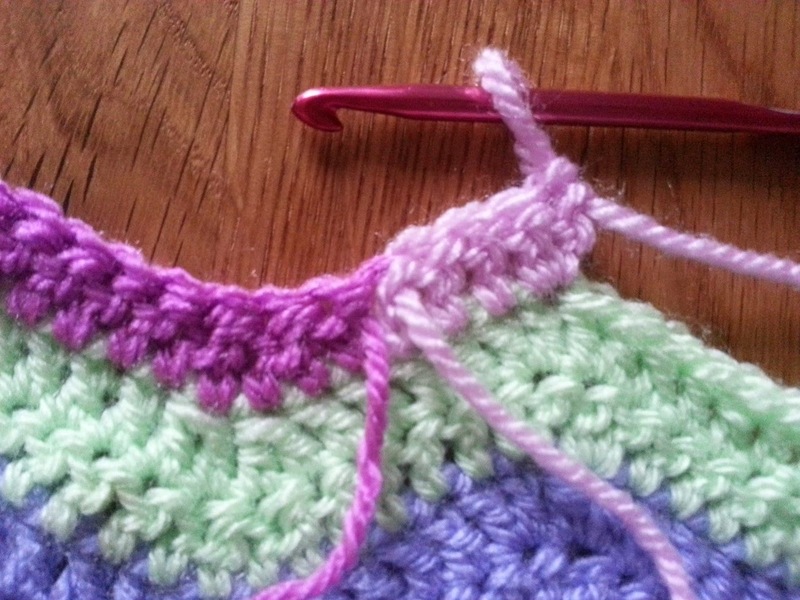 The best way I have found for joining part way through a row is to simply start crocheting with the new yarn! Don't knot it, or slip stitch it in or anything like that, just yarn over, put your hook in the next stitch and carry on with no interruption. When you get to the end of the row you can then take care of sewing the ends in. I also like to make a little knot first with the tail ends before I sew them in. Doing it this way ensures that you have any joins on the back of your work rather than the front, leaving the front looking seamless! This also works if your yarn is knotted when you buy it. I heard (can't remember where from) that manufacturers are allowed to sell yarn with up to three joins per ball. Quite often these knots are at inconvenient places so I do the same with those - cut the old knot out of the yarn and join using the method above. What a week! At last I have got myself a new job and I started on Friday. 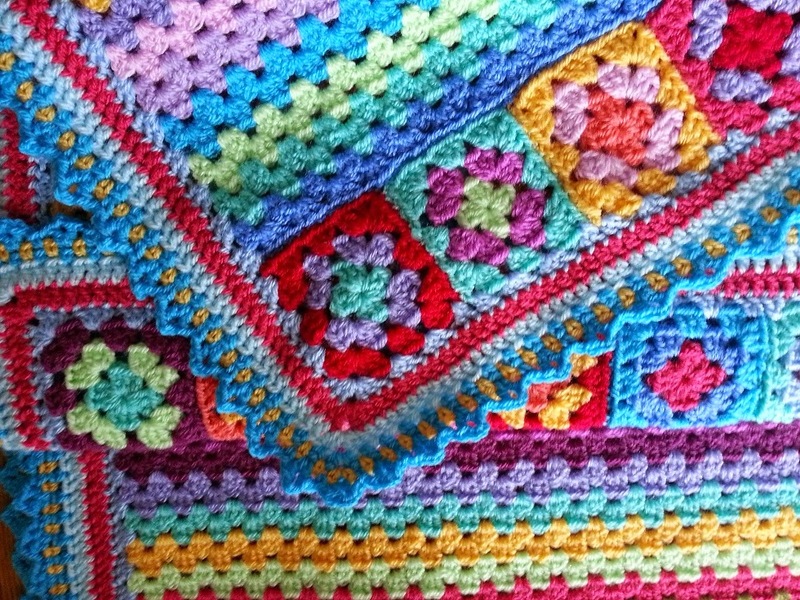 It is bitter sweet as I have really grown to love being at home all the time, pottering around, crocheting probably a lot more than is strictly necessary and enjoying lots and lots of me time. But work I must, at least until that big lottery win. My new job has also meant that I need my own transport so we went and got a little blue car in the week and it is so much fun! We have had lots of debates over who will drive which car, one is big and comfortable, the other is small and nippy. I was resistant at first and insisted that we share equally but the more I drive around in the little blue one the more I love it. Also, if I claim it as mine I can perhaps give it a teensy tiny bit of wooly treatment. I'm not talking a full on yarn-bombing here (although it is tempting) but maybe a blanket to pop on the back seat in case of getting stranded, and perhaps a seat cover or two! So that's my big news for the week, trying to get in the work mindset and yet keep hold of the things that I have enjoyed so much about being at home. The biggest part of that is this blog which I am so grateful to you all for reading. 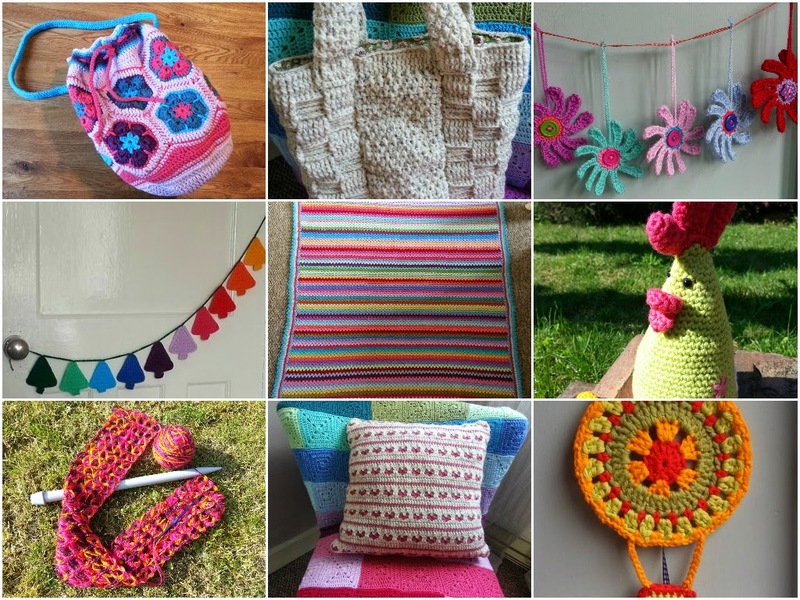 For the last six months or so it has been a very important part of my days, writing a few patterns for you and sharing what I've been making. That's just some of it! And today my little corner of blog-land has reached a bit of a milestone, 15,000 hits! I am so pleased I can't tell you, it really means a lot that so many people have popped by to see what I've been creating and read my ramblings. I would like to say thank you in a more meaningful way so later on this weekend (maybe today, depends how the housework goes) I shall write up a new pattern for you for my new chunky slouchy hat! Please excuse these pictures but it is raining and my husband is still in his pj's (!!!) and wouldn't come out into the garden for a better backdrop and light. So instead of greenery you get my battered little greenhouse and a pile of bricks! 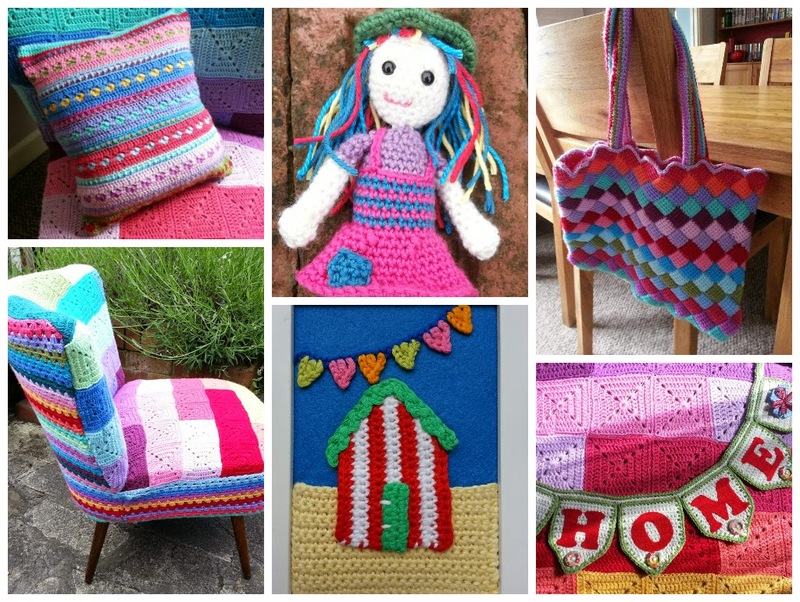 I do hope you are all having a good week so far full of lots of colour and creativity. A bit of a pity post from me today - I have a poorly yarn finger. I thought it was getting better but is now all swollen up like a sausage and very painful. 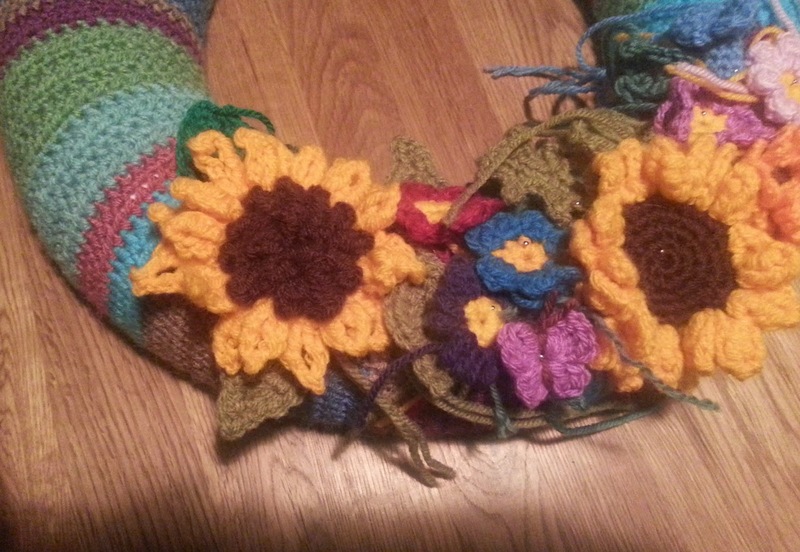 This hasn't stopped me crocheting, just slowed me down a bit. I know I would do better to leave off the hooky for a few days to let it mend properly but I am really struggling to do that. What do people do with their hands when they are just sat doing nothing, or watching TV or listening to music? I can't seem to remember how to sit and do nothing, it feels all wrong not to be making something. I treated myself to one solitary 100g ball of baby chunky the other day so I could have a little experiment and see what it would look like to do some broomstick lace and cabling in chunky. I haven't managed to do any of that with this sausage-finger but just couldn't resist using this wonderfully soft yarn. 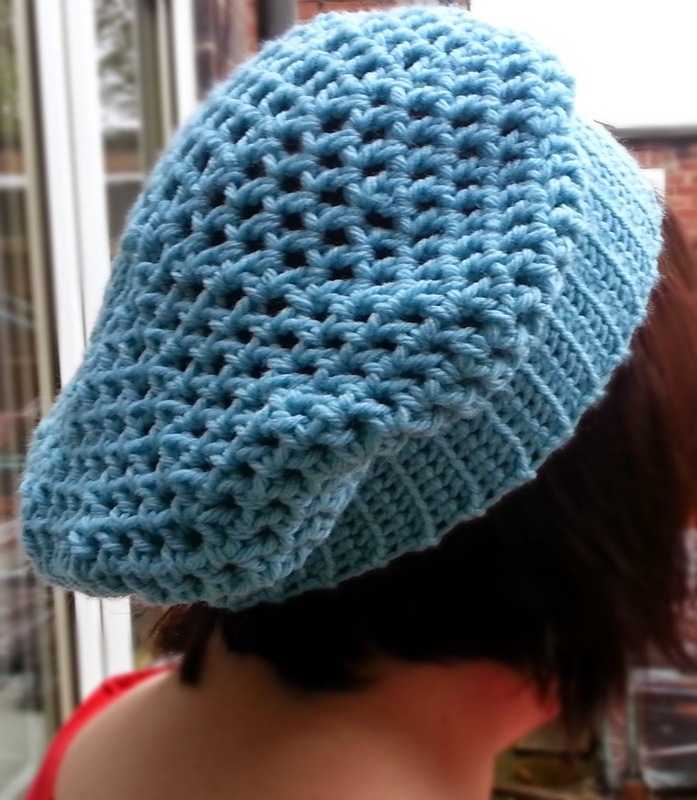 I decided to make a very simple slouchy hat with it. I've decided on quite a gappy mesh effect, perhaps not the best for keeping out the cold but I wanted to see if I could make the entire hat in one ball. 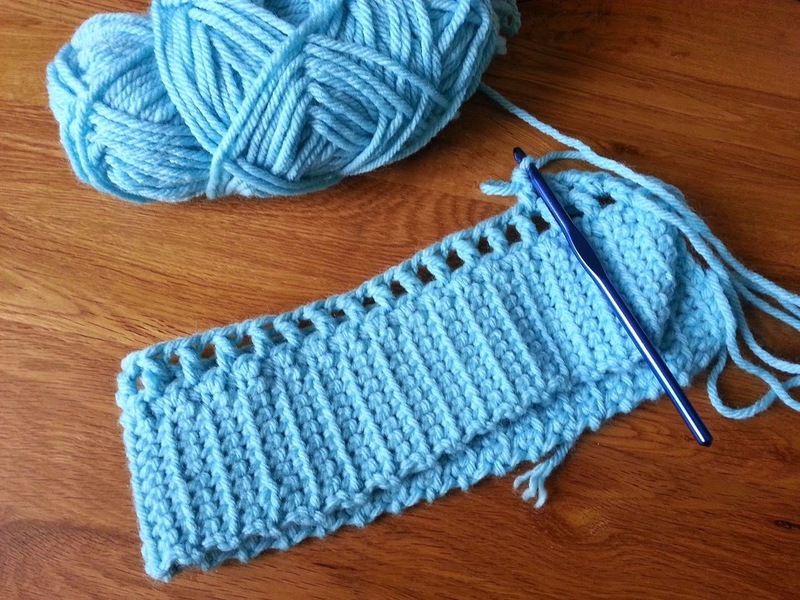 So it's been a matter of a making a row, then putting it down to rest my hand, then making another row and then more rest. Considering I am taking it very slowly it is growing nice and quickly. It's an extremely simple pattern too and if it all works out OK then I will of course share it with you.